CPM calculator helps you with cost and volume of advertising traffic. 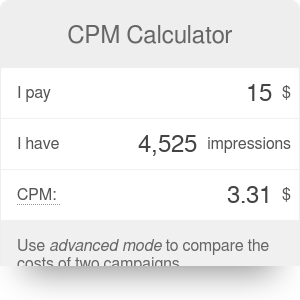 CPM calculator helps compute a basic task for online marketers and publishers. Knowing how to calculate CPM comes into play when advertising budgets are considered. CPM is shorthand for cost per mile or cost per thousand and is a common measure of volume in advertising. This calculator works either way, so it may be used to calculate either the cost, CPM or number of impressions. If you'd like to combine it with cost per click, use our CPC and CPM calculator. Online marketers also love the online conversion calculator (check it out, it's a powerful tool!). CPM Calculator can be embedded on your website to enrich the content you wrote and make it easier for your visitors to understand your message.